Where did the week go? Well, it doesn't really matter where it went, what's important is that it brought us to MMG Friday in record time! Today I chose to feature Deana of BELLACOSAART. Deanna, AKA Bella, is a dedicated artist who's always trying something new, and I'm happy to say I own a few of her originals. 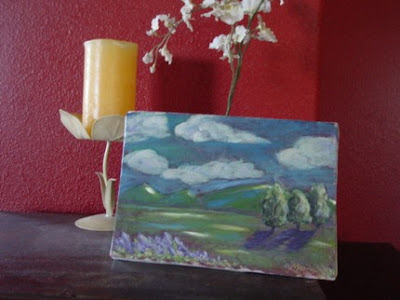 This gorgeous landscape (on a recycled cedar plank) hangs in my bathroom & I added this whimsical ACEO to my collection. 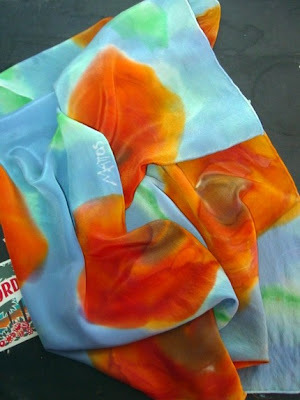 My favourite piece from Bella though is definitely my hand-painted silk scarf. It feels amazing around my neck & looks great under my navy coat. I love being able to wear a work of art around my neck! 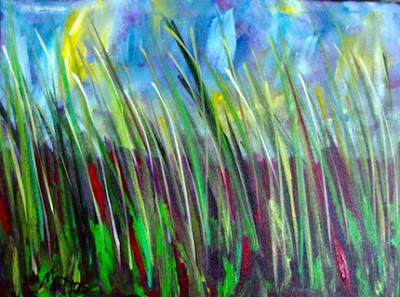 Grass original acrylic - I'm a big fan of Bella's more abstract work. I love the bright colours of this piece. Eco Art - this piece is similar to mine - painted on muslin stretched over an old piece of cedar siding. Such relaxing scenes make you want to wander into these fields & take a nap in the shade of the trees! karalennox: I've bought an ACEO from Bella. I gaze at her paintings as inspiration to make mine better! But more than anything I appreciate Bella for her calm, good-natured presence on the list. I love how she and her mom are so loving and supportive of one another. Fall is soon upon us - this bull elk is absolutely stunning. He looks about ready to jump off the canvas! iWunder: Whenever I want a new, spunky little watercolor, I know I can go to BellaCosaArt and find just what I am looking for! Bella has the amazing skill of being able to blend bright and pastel colors together to create the most beautiful little works of art I've ever owned. Her paintings are inspired by the nature around her, in her vegetable garden and her Montana backyard, and she continually challenges herself to try new things and paint in new styles. I know when she is famous one day, I can say "I knew her when..." and show off my collection of Mattos art from her. 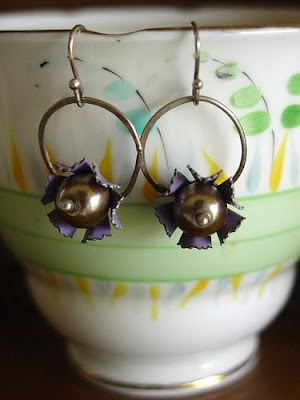 Ring around the posies - lately, Bella has been experimenting with jewelry making & metal work. 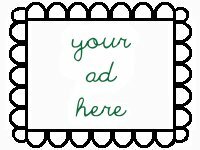 Hopefully, she'll be adding more to her shop soon, but in the meantime, you can browse through her portfolio on Flickr. 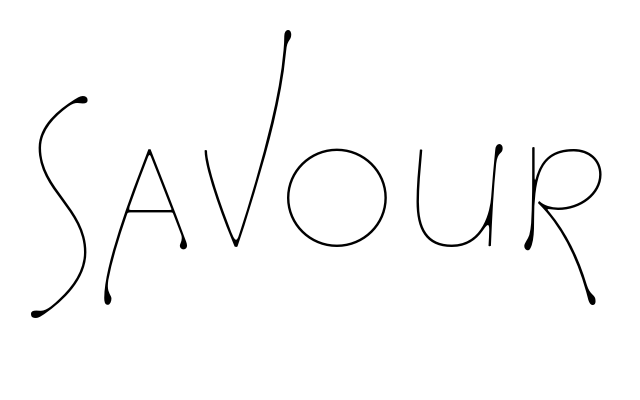 Which is your favourite BELLACOSAART original? Deana is always helpful, encouraging, and fun to be with on the MMG thread. 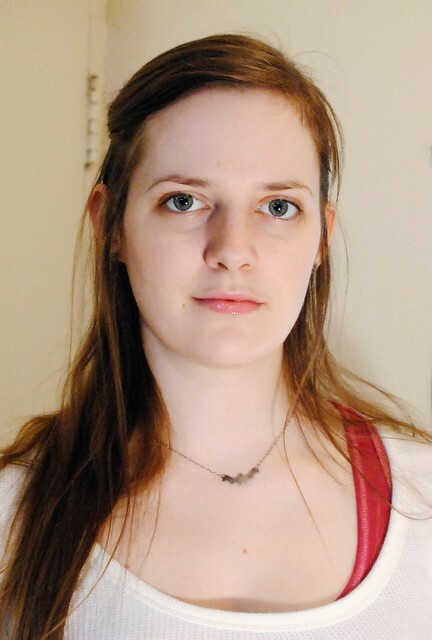 She's a daily contributor to our Etsy Forum thread, but more importantly, a daily contributor to our lives. It's an honor to know her and it has been an absolute pleasure to witness the growth and expansion of her art! Now I can sympathize with iWunder's ugly face cry of last week, I am doing the same cry, thanks so much Uli and everyone, you all really know how to make a artist girl's day, week, month, year... well you know. Awwww this is absolutely uplifting to a passionate artist BELLA. I'm inspired to be true to my style as me. Incredible write up Uli and friends. Very nice feature! I own several of her pieces and I love them all! She's my sister. Thanks for supporting her! 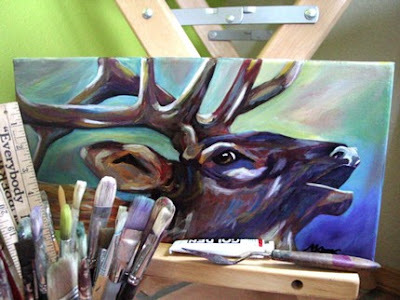 i love the buffalo paintng and the bull elk is also amazing. i purchased this amazing note card printed form a painting of a lively rooster. i thought i would be keeping it but i gave it as a gift to my fav aunt! she has it framed in her kitchen! we all know what a great artist BELLA is... but she has been there for many of us when we needed advice or a good laugh! thanks bella! and ULI- great pick for your friday feature!